Would you vacuum your carpet if it didn’t look dirty? Probably not. Unfortunately, many people look in the mirror and don’t see anything on their teeth so they assume that their teeth are clean. If only they knew the truth! There are millions of bacteria that live in our mouths and cling to our teeth. You can read more about dental plaque here. The problem is that plaque is very hard to see for the untrained eye. Luckily, there are products such as plaque disclosing tablets and plaque disclosing solutions. This is a type of dye that adheres to plaque in your mouth allowing you to easily visualize it – and remove it. If you see plaque on your teeth, you will want to remove it! 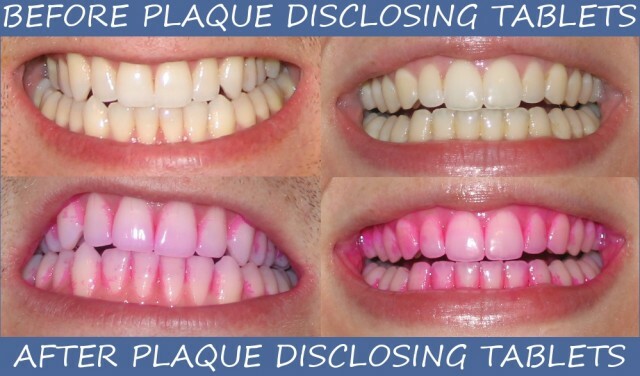 Once you have used plaque disclosing tablets and/or solution a few times, you will figure out where the plaque tends to hide in your mouth, thus increasing your brushing efficiency. As you can probably tell, most plaque accumulates between our teeth. The area between our teeth is an area where plaque are less likely to be swept away by our tongue when chewing or by our toothbrush when we brush. The best way to remove the plaque between our teeth is by flossing. 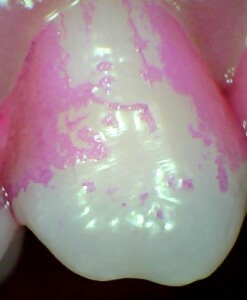 To the right is a close-up of one of my upper pre-molars, clearly showing all of the plaque living between my teeth. Pretty gross, right? 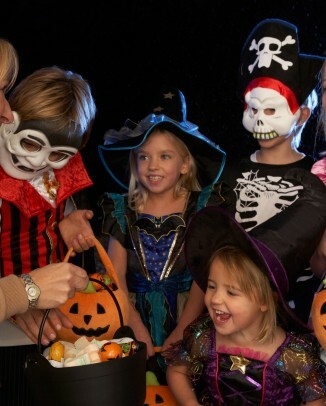 Do you want to find out where the plaque is on your teeth? Or do you need help motivating your toddler to brush? Try showing him or her where the “bugs” are living on their teeth. Actually seeing the plaque will motivate children and adults alike. 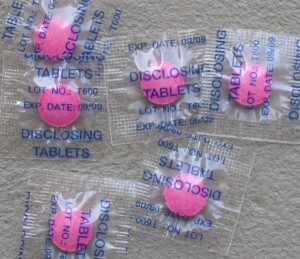 You can find plaque disclosing tablets at most local pharmacies. If you’re into buying things online, here are a few options from Amazon: 1 – Butler GUM Red-cote Dental Disclosing Tablets Pack of 250 tablets – Name brand chewable tablets. 2 – Young Dental 2 Tone Disclosing Tablets Pack of 40 – Great chewable tablets. 3 – Young Dental 2 Tone Disclosing Tablets Pack of 250 – Large pack of chewable tablets. 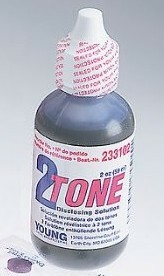 4 – Young Dental 2 Tone Disclosing Solution 2 Fl Oz [Pictured] – This is the same liquid that most dentists and hygienists use. You can easily swab it onto your (or your child’s) teeth with a q-tip to find out where the plaque is lurking. Do you have any questions or comments about plaque disclosing tablets or solution? Feel free to leave them below in the comments section. Thanks for reading! I remember chewing these at my dentist’s office when I was younger. A lady would take me into a side room and show me the big model of teeth and teach me how to brush. Then, I would chew up the pink tablet and she would have me look in the mirror at the pink on my teeth. Then, I tried to get it all off! I didn’t know you could buy them – I thought only dentists could get them. I think they would be great for my kids in the future so they can learn how to brush. Thanks for the comment, Melody! I didn’t know that they could be purchased by regular customers until I got to dental school. I hope they motivate your children to brush! 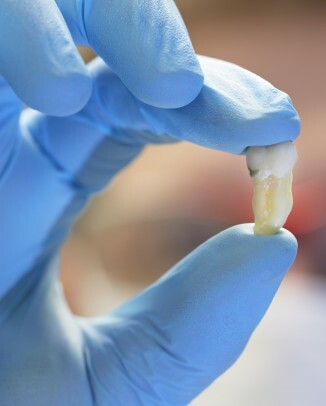 My name is McKayla and I am in the 9th grade and my friend and I are doing a science night project on plaque on the average humans tooth do you have any suggestions on how we will be able to see what it is made of or how it is made? Please if you can help, Thank you it will be much appreciated!!!!!!!! Plaque is an exciting topic! 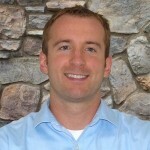 If you haven’t read it yet, here’s an article I wrote about plaque called What Every Human Needs to Know About Plaque. Plaque is made up of bacteria that create a sticky substance which helps them to attach to your teeth. If you brush your teeth, you scrape away millions of these bacteria. 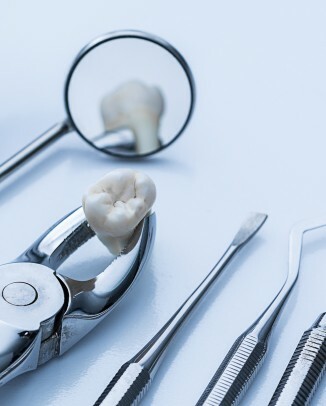 There are always bacteria in your mouth, so after you brush they jump back over to your teeth and re-attach, waiting for you to eat something sweet so that they can reproduce and make a lot more plaque to hurt your teeth. You’re welcome to use the picture above of mine and my wife’s teeth with the plaque disclosing solution if you want. I hope that helps. If you have any questions at all, feel free to come back and ask. Thanks for your comment! I used some disclosing tablets today and my teeth were pretty much fine apart from a few areas between a few teeth…however the entire inside of my mouth (cheeks, gums, tongue) are bright purple. My husband did the same, but although his teeth were bad, the solution didnt adhere to his flesh like it did with me. Does this mean I have plaque on my flesh – is this possible, or am I just prone to skin staining? Not so important. Plaque puts out a very small film of acid, which directly touches the calcium of teeth, protected from being washed way by this bushy jungle. 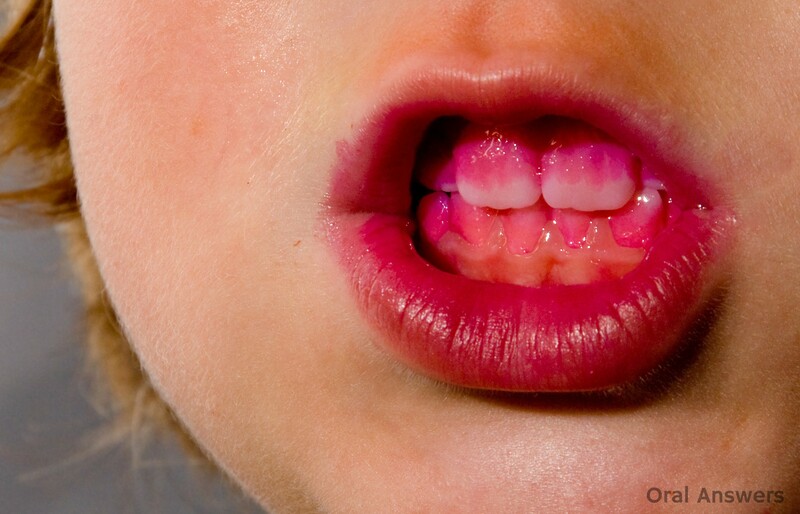 Cheeks are like the tongue that they do not form plaque of depth (living and growing, it sheds very quickly and has anti bacterial bodies), but unlike the tongue it has a smooth surface, so can not nearly as easily hide food particles which spread sustainance for the bacteria producing plaque on the teeth. So I have heard. Hope it helps. And it is that plaque that lasts more than two weeks that does the dirty work. Cheek cells have swarms of bacteria, by far the most outside of our solid disposal system, but you get the idea. It is the colonies on teeth that make the difference, and so many are in the mouth at one time it is hopeless to try to stop it by clean cheeks. However, some say it does help to eat plain yogurt at the end of a meal. Yes, you brush, but the yogurt bacteria culture is much less harmful than sugar and oxygen hating cultures. Better to build up colonies of those, instead. These colonies form in everyone’s mouth within hours if not minutes anyway. I never even knew these existed! LOL. This will make it very easy to motivate my toddlers to brush. Thanks again! The white coating on top surface of my tongue is biofilm, does it form on all of the tissues in my mouth? My son has been using these and they’re great at showing where the plaque is on his teeth. But he has new areas every brushing that get stained and we can’t get the stain off except for some serious, almost painful scrubbing (and it was clean the night or morning before when we last used them). Do some people simply have stickier plaque than others? He’s frustrated to tears that he can’t get them clean himself (he’s almost 8), and even my husband and I have a hard time getting his teeth clean. I’ll take any advice I can get to help him!!! I’d like to know about this before trying these with my daughter. I have a horrible time getting her to brush correctly. Although I love the idea of using these tsblets, I cannot imagine how frustrating it would be if the stain could not be removed. I always dread going to the dentist. I am among the people who don’t like brushing their teeth or flossing. So, maybe I should try the plaque disclosing tablets. Seeing the plaque on your teeth is making me want to brush more, perhaps if I see it on myself it will work even better. Thanks. I did this and purple is on my tongue now and it will not come off plz help me figure out what do!!!!!! What makes the plaque show up? You are right when you said that people wouldn’t vacuum their carpet if it didn’t look dirty and that our teeth were the same. I actually went to the dentist a few weeks ago and tried one of the tablets. I thought I brushed pretty well, but I was in for an eye opener. The dentist informed me that plaque is bad because the longer it stays there, the more likely you are to get a cavity. I would recommend everyone to try to tablets- they help you take care of your health and save you a lot of money!